Thomas is currently Acting Principal trombone with the Houston Grand Opera. He is also recording a solo-CD to be released by the Tierra Studios label by September 2009. He started playing at the age of ten in the local Salvation Army Band in his hometown of Katrineholm, Sweden. After completing his military service with the Swedish Army Band in 1984, he studied trombone performance at the Gothenburg Conservatory with Ingemar Roos as his primary teacher. After graduating he won a position with the Bohus Big Band, one of Sweden’s two professional big bands. 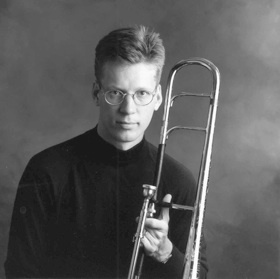 In 1990 Thomas became a member of the Hässlö Brass Ensemble (later re-named Messing Around), a full-time brass ensemble, along with being Principal trombone of the Västerås Sinfonietta. He was also a sought-after freelance player, and has performed with the Gothenburg Symphony, the Gothenburg Opera, the Helsingborg Symphony, the Norrköping Symphony, Stavanger (Norway) Symphony and the Trondheim (Norway) Symphony. Since moving to Houston, Texas, in 1997 he has performed with Ray Charles, Tony Bennett, Dave Brubeck, Natalie Cole, Barry Manilow, Patti Austin, Johnny Mathis, Michael Bolton, the Moody Blues, the Temptations, the Four Tops and the O’Jays. He performs regularly with the Houston Symphony, the Houston Ballet, the Houston Grand Opera and Theatre under the Stars. Thomas was in the orchestra for the touring Broadway musicals “The Full Monty”, “The Producers”, “42nd Street”, “Music Man”, “All Shook Up”, “Swing” and, most recently “The Rat Pack” at the Hobby Center in Houston. He has been featured at the Texas Jazz Festival and the Kemah Jazz Festival with his own group, and at the International Trombone Festival, both as a soloist and as a member of “Spiritual to the ‘Bone”. His quartet opened for Maynard Ferguson’s Houston concert in February of 2006. Thomas teaches low brass at the Houston Baptist University and the Houston Community College, and directs the jazz ensemble at the Tomball College. His wife Tina is a microbiologist at Baylor College of Medicine, and they have three sons, Jakob, David and Philip.